The Process Is Finished – But What A Ride! Inauguration Day January 20, 2009. A very historic Day. The great miracle of our process again will work like clockwork. Power will be exchanged peacefully without bloodshed. Very few countries can claim this. God bless America! On this historic day I can’t go without remarking on what this day means or the unprecedented road we’ve taken to get here. For the first time in many decades neither Party had an incumbent running or their Vice President running to succeed. What ensued was the longest, wildest, free for all in American political history fought between the largest and most diverse set of candidates this Nation has ever seen! For the first time a woman, a Hispanic, a Mormon, a man of Jewish faith, a Catholic, a former Baptist preacher, and two African Americans (yes…Alan Keyes tried again) all ran for the highest office in the land! Yes the process was long and grueling and at times painful (too many meaningless, poorly-run debates!). However we’ve grown as a people and as a Nation through it. More citizens than ever before participated in the process, many of them for the very first time (myself included). A spark has re-lit the flame that is our Republic as I feel more and more people are getting involved in the Democratic process. Even on the losing side the followers of Mike Huckabee and Ron Paul are now just as active (or even more so) than during their respective campaigns. The process begun two years ago and ends today at the White House. Only 40 years after Jim Crowe was banished we have elected an African-American to be our leader. Barack Obama may not have been my choice for President (not that I liked John McCain that much more) but today he will be sworn as as our 44th President. Even though I had hoped another man would be taking charge today, My thoughts, prayers, and hopes are with our new President. I hope he can lead our Nation through these rough days. My ideology is much different from his and I know I will respectfully disagree with him in the future. However, today I celebrate along with the rest of our Nation on this truly historic and momentous day. The people of Georgia have spoken. They have recognized the tremendous job that Senator Saxby Chambliss has done in the United States Senate, and have voted to return him to the Senate. As you know, Saxby Chambliss is a strong supporter of the FairTax, and his victory tonight is a clear indication that Georgia voters support the FairTax also. The Democrats threw every weapon at Senator Chambliss that they had, including former President Bill Clinton, and a radio ad by President elect Barack Obama. But the voters of Georgia recognized the job that Saxby has done for them in the last six years and voted this evening to keep him working on their behalf. Saxby Chambliss’ victory means that the Democrats will not have their veto proof majority. But more important than that, Saxby’s victory means that a solid conservative returns to the Senate to fight for the conservative Republican values that are so important to all of us. Saxby Chambliss has been a strong conservative voice since his election in 2002. He is known as a champion of our military and serves on the Senate Armed Services Committee, Senate Select Committee on Intelligence and the Senate Rules Committee and is the ranking Republican member of the Senate Committee on Agriculture, Nutrition and Forestry. Congratulations Senator Chambliss on your victory. Thank you to the voters of Georgia. A special thank you to all the Huck PAC supporters who helped by making phone calls. SAXBY CHAMBLISS DECLARED WINNER OF GEORGIA SENATE RUNOFF!!! With over 50% of the vote counted and a margin of over 200,000 votes thus far, all the major media sources have now declared Senator Saxby Chambliss the winner over Jim Martin in the Georgia US Senate runoff! the FairTax has retained it’s sponsor in the Senate and the Democrats have failed to gain their super majority! CRUCIAL RUNOFF ELECTION IN GEORGIA TODAY!!! We have finally reached the end of the 2008 election cycle. Other than the runoffs in Louisiana on Saturday (HuckPAC, and I endorse FairTax supporter Dr. John Flemming for election to the US House in LA-4). However today is the crucial runoff election in Georgia. Why is this so important? Senator Saxby Chambliss is the last man barring the Democrats from achieving a 60-vote super majority. WE MUST KEEP SAXBY IN THE SENATE!!! To all my fellow Peach State readers please go out and vote for Saxby! Don’t just go by yourself. Take your friends and family with you (as long as they are voting for Saxby)! The polls opened up this morning at 7 AM and will close at 7 PM. GET OUT AND VOTE FOR SAXBY!!! Chambliss is the sponsor of the FairTax bill in the Senate and we can’t afford to lose him. Georgia Senator Saxby Chambliss is facing a runoff election on Dec. 2 against his Democrat opponent Jim Martin. Democrats are pouring hundreds of thousands of dollars into the state to defeat Senator Chambliss. President elect Obama has turned his grassroots organization in the state over to Jim Martin’s campaign and his supporters nationwide are making voter contact calls into Georgia urging people to vote on December 2. We can’t afford to lose Saxby’s voice in the Senate. Saxby is a fighter for our conservative ideas, and someone we can count on to stand up for the FairTax and fundamental tax reform. We need your help. Will you make 5 calls to Georgia voters for Saxby Chambliss? You can do so by logging into our new Georgia phone bank on our website. We provide you with a short script and make the calls very easy. You will be calling real Georgia voters and helping us turnout the vote for Senator Chambliss. The facts are that Saxby Chambliss is a consistent vote for lower taxes, controlling spending, life and traditional marriage. He is facing a tough, well funded opponent that has the support of Barack Obama and his army of liberal activists across the nation. The battle lines are clearly drawn in Georgia and only a nationwide effort of conservatives rallying to Saxby’s side will make the difference on Dec. 2. Help me support Senator Chambliss. Even if you call one voter, please do so today. Our goal is to contact at least 10,000 voters and we are counting on your participation. Do The Right Thing – Mike’s New Book Debuts Today!! Today is the day! 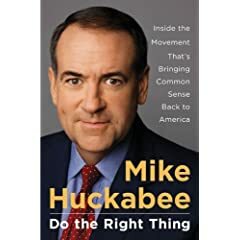 November 18th has been long circled on my calendar because it is the long-awaited release of Governor Mike Huckabee’s new book, Do The Right Thing! It is the story of Mike’s long shot campaign that ended up winning millions of votes and hearts. Also in his new book, Governor Huckabee explains what we need to do to the the Republican Party back on track. In a Blogger’s call yesterday Mike said that his book would be just like his campaign, brutally honest. He’s not writing the book to tell everyone what they want to hear. It’s very provocative and Mike is telling it like it is and wasting no punches at the process, some of his former rivals, the media, and Evangelical leaders. However the focus of the book is pressing the RESET button, not the REWIND button. A Major focus of the book is how the Republican Party and Conservatives can move forward. There is a whole chapter on the FairTax and its benefits. Energy Independence, education reform, and the importance of social issues are discussed. Also written in the book are the awesome insider stories from the campaign trail, including the story of our very own TRUCKER RANDY!! This book is not to be missed and if you haven’t ordered a copy you can buy one at our Amazon Web Store. In fact copies of this fantastic book would make great Christmas presents for anyone on your list! You can also get your copy signed while Mike is on his 56-city bus tour over the next three weeks through the Southeast and Midwest. Mike hopes to expand the tour to other locales (like out west) across the country in the very near future.